For the past few weeks I have been swept up in a delightful, merciless whirl of sewing gigs, family cottage time and motivation-crushing heat, but right now I do believe it’s time to catch you up on the wedding dresses! 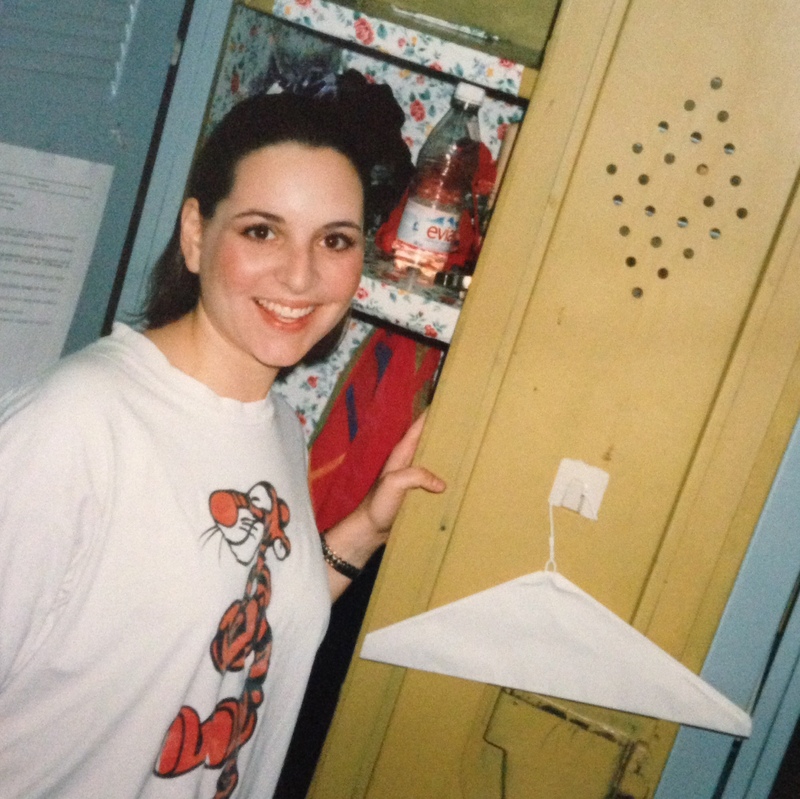 In my June post Starting with a Navy Wedding Dress, I shared a wedding dress I was working on and mentioned another one I was about to start. 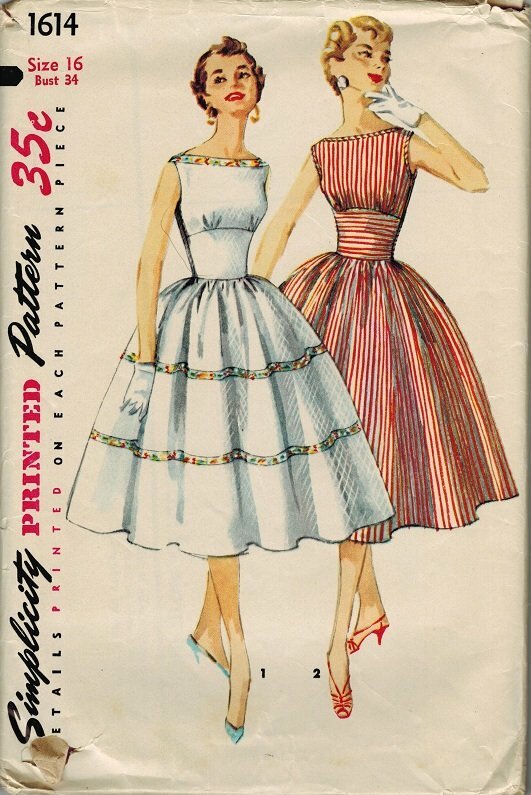 The second dress, the ochre dress, started with a Simplicity pattern from the 1950s with a bateau boat neckline and an empire waist. We found the fabric, drapery fabric if you can believe, loving how it complimented the navy silk with pearl-white illusion top on the first dress. I carved the high, bateau neckline down a bit to reveal the bride’s collarbones and a little shoulder blade at the back. I also added a ruched waist, but kept the high, curved empire line of the original pattern, a nice architectural element for a bride who’s an actual architect by trade. Because of the wonderful pattern on the fabric (yes, it is total put a bird on it fabric, cue the jokes, I can take it) we bought extra yardage so I could place a bird over her chest, like a designed-in corsage, and across her shoulder on the back. By now, both dresses have been made and each has done her duty well: adorning their respective brides down an outdoor aisle on a family farm in one of the most profoundly simple and sincere marriage ceremonies I have even been graced to witness. What a lovely, secret pleasure to see my work walk and swirl the night away on two beautiful ladies so truly in love. 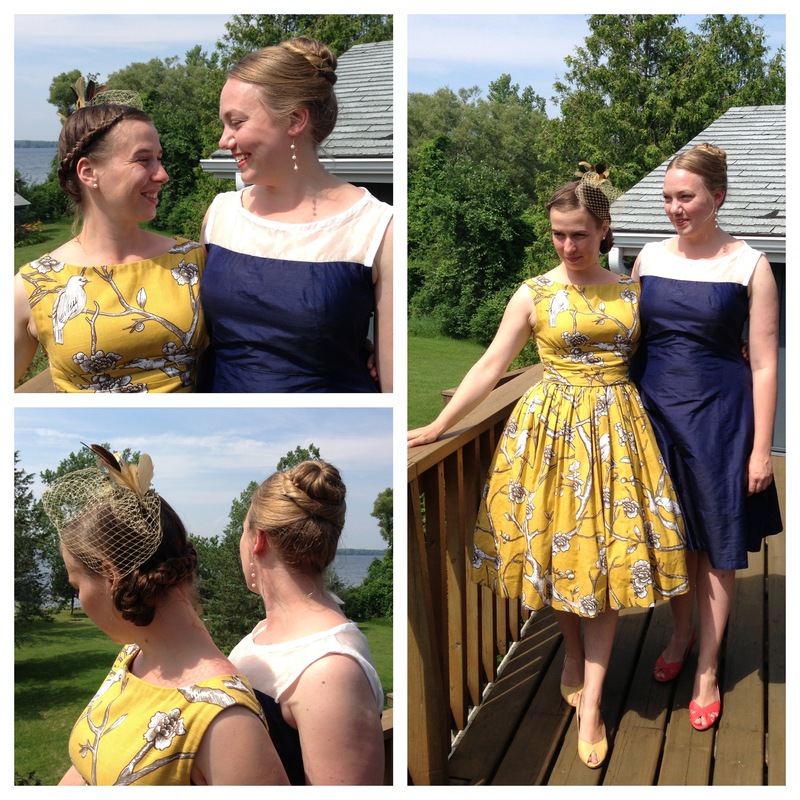 I am grateful for the honour of dressing my friends Ann-Marie and Leah. I even got to do the hair, a secret pleasure of mine (seriously, if you ever want a french braid or a bun, call me!) and Leah fashioned her fascinator with perfectly matched ochre French netting. Look how they radiate adoration for each other and how well (if I do say so) the dresses stand beside one another, so different yet complimentary. Since I was also a guest at the wedding, I needed a gift. And I knew just what to do. There was enough fabric to piece together a quilt from their wedding fabric. And since Ann-Marie and Leah are the handmade-appreciating, sentimental kind of folk, obviously my favourite kind, I knew they’d enjoy the effort. So in between making their dresses I put together this wedding quilt. 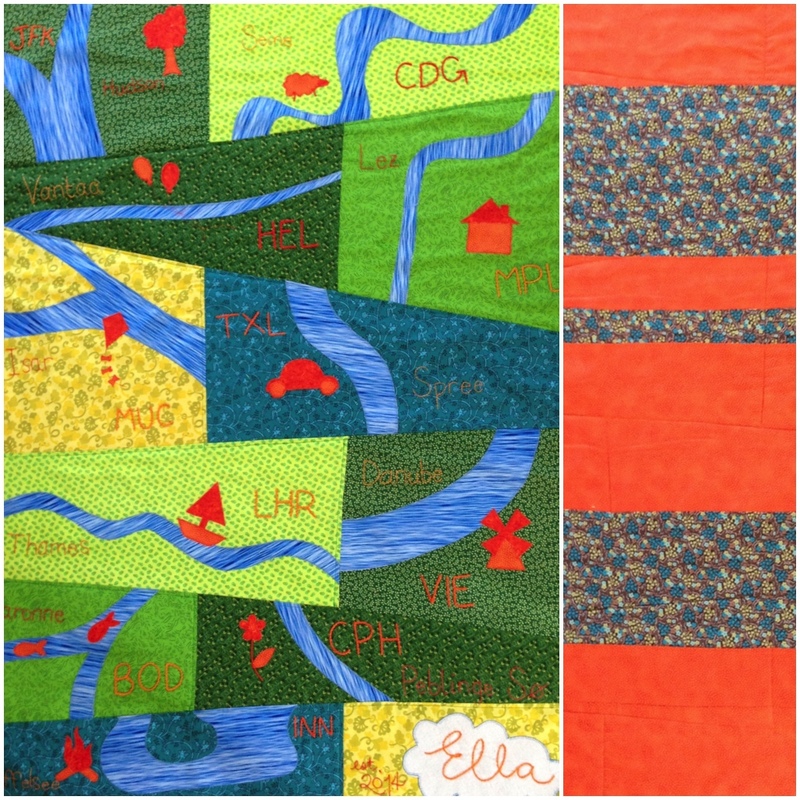 I’m a total quilting novice, but I loved every minute of it, learning to mitre corners, quilting the pattern of the ochre fabric so that it appeared in relief on the flannel back, stitching hope and love and perseverance into each seam. 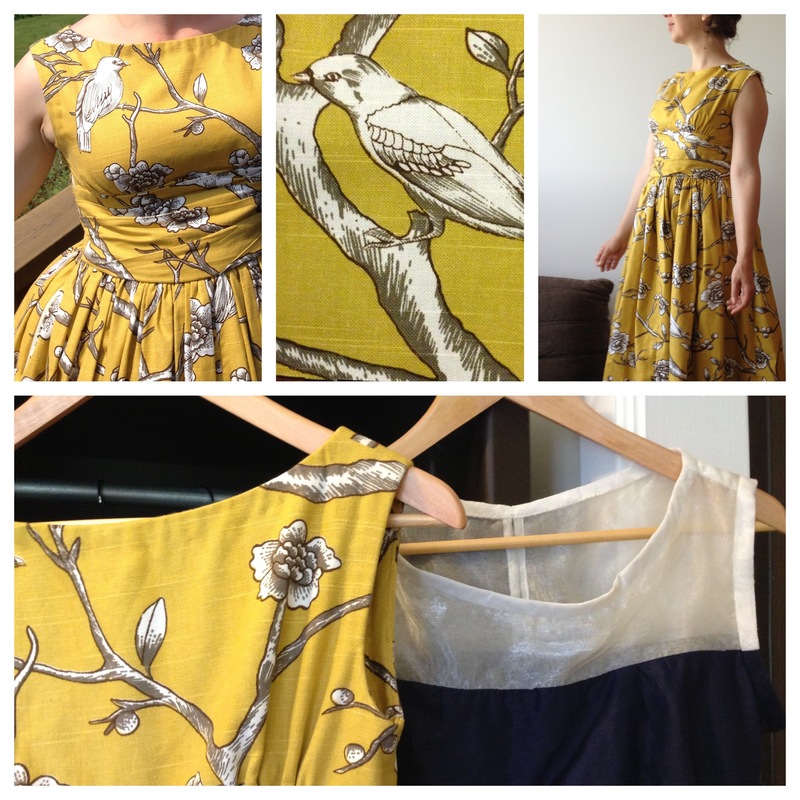 Altogether the most satisfying commission I have ever receive as a designer and seamstress. And two long-time acquaintances because wonderful bosom-buddies through the process. You cannot beat that. I’ve been true to this challenge all year, having made a patch for each month thus far. But while August got made, the poor dear never got photographed or blogged! 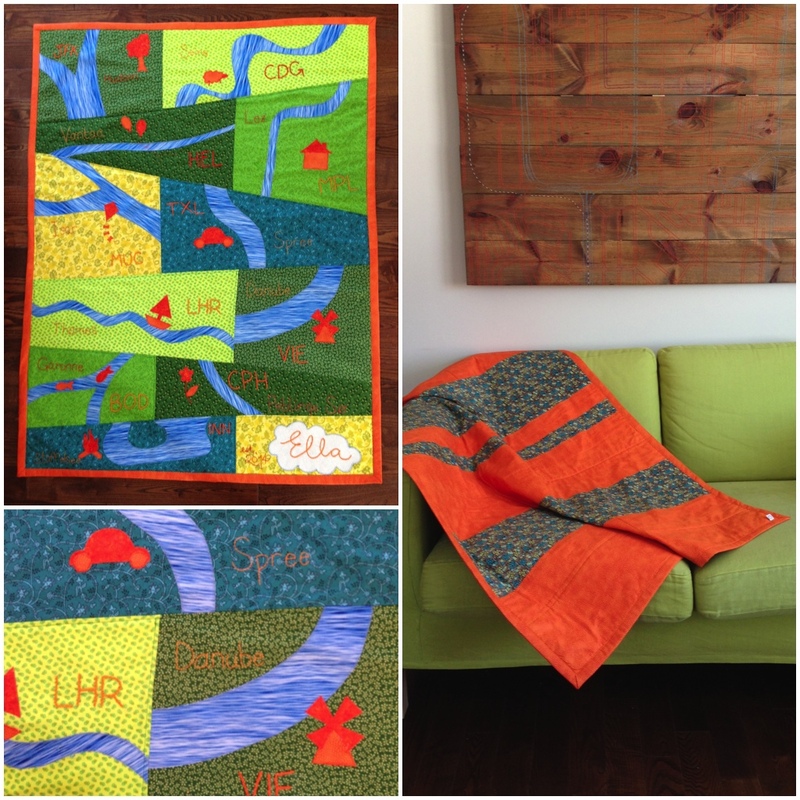 So I’m catching up … onwards with my 2012 Quilting Challenge! I’ve made paper patterns for all my designs so far but while contemplating a star pattern in August, I was struck by the fact that I love how a freehand star looks, like it was doodled on the back of a school notebook. So I freehanded August. The star looked lonely by itself so I added some rays and I love the result! 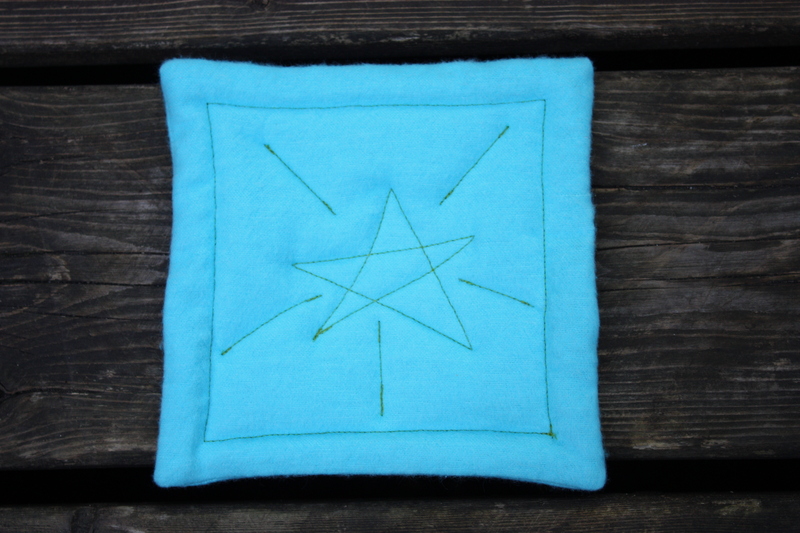 For September, another freehand — I love it, it’s like drawing with my sewing machine. 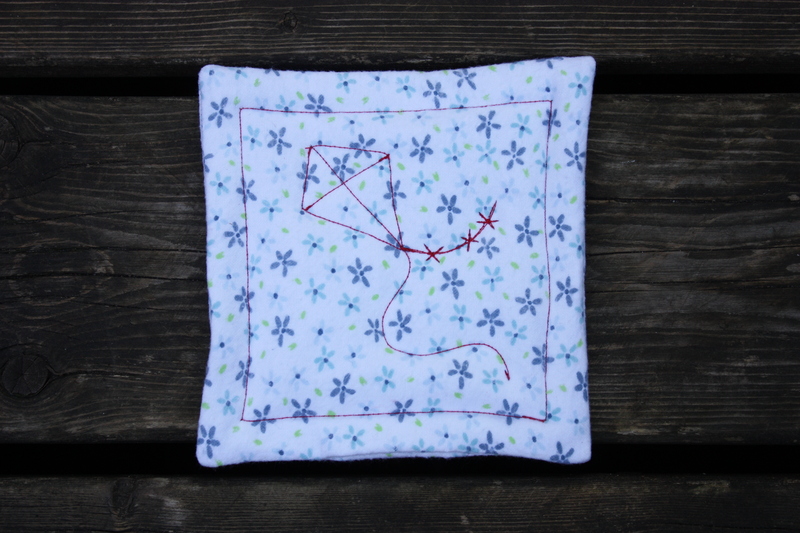 A little kite to catch the fall breeze. And here are all 9 pieces thus far. I love that it looks like a quilt! 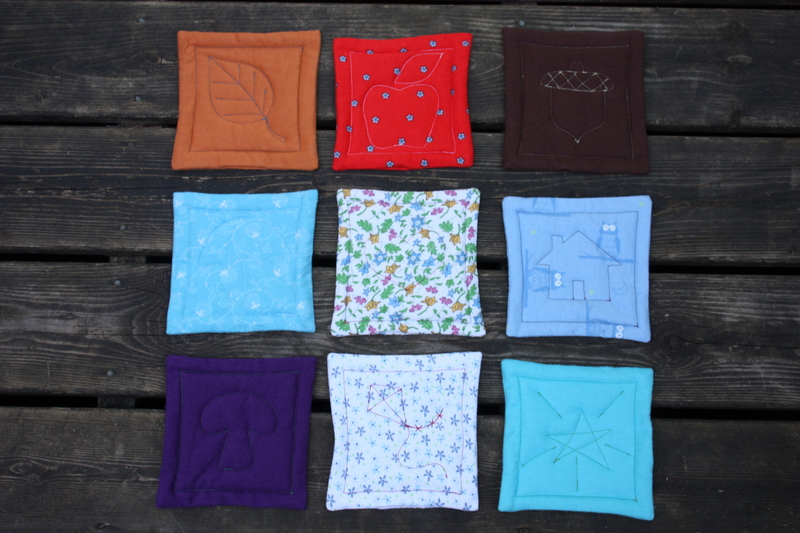 I’m planning to make a garland from them but I think I might try a quilt too, with one pattern in each square. Oh crafty plans, I have too many of you! 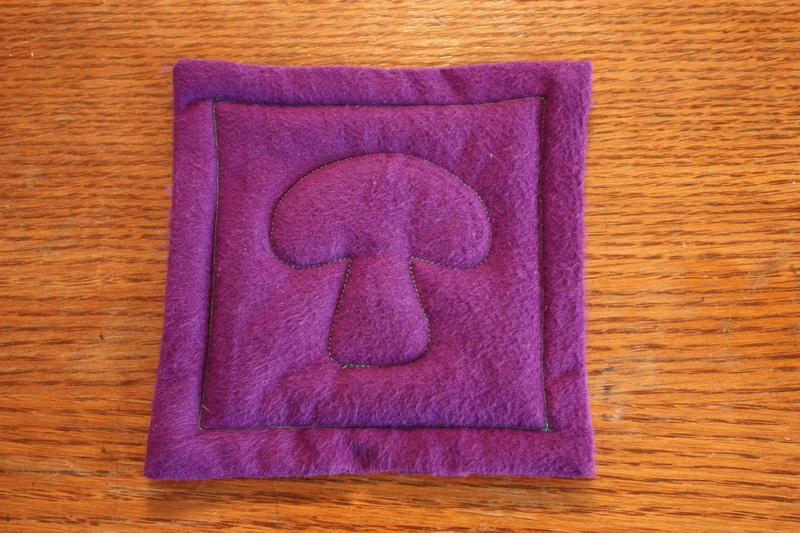 I cheated this a bit and sewed July’s patch in June! Because I’m currently on the road so I used the brilliant pre-set publishing option on the blog and set this up a few weeks ago! Delightful. Sometimes I adore technology. And wow, check it out, I’m stickin’ to this challenge! 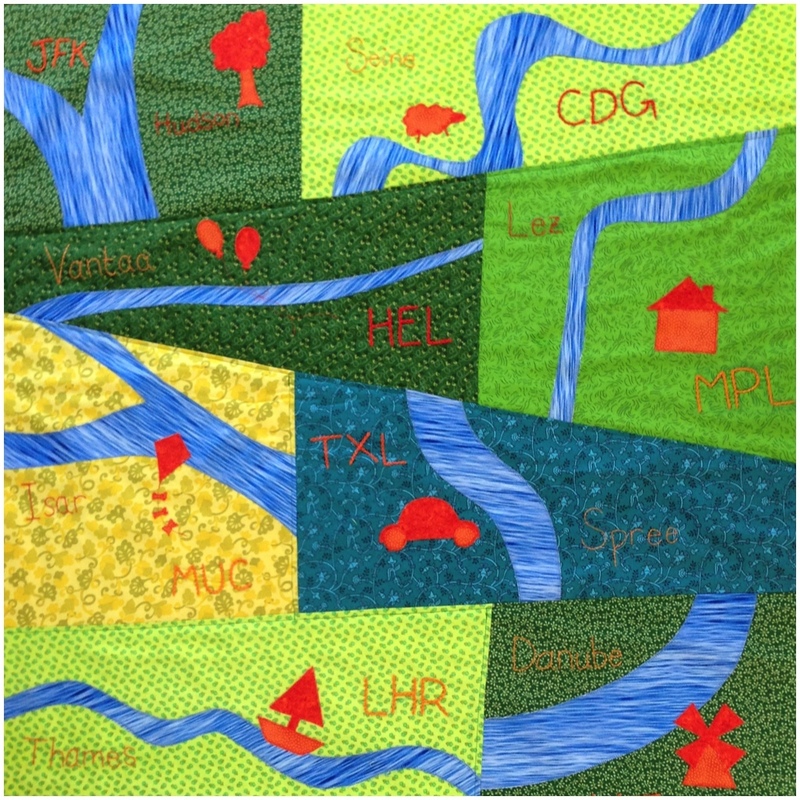 There are 7 quilt patches with 7 original designs for my quilting work and 7 months of 2012 have passed. 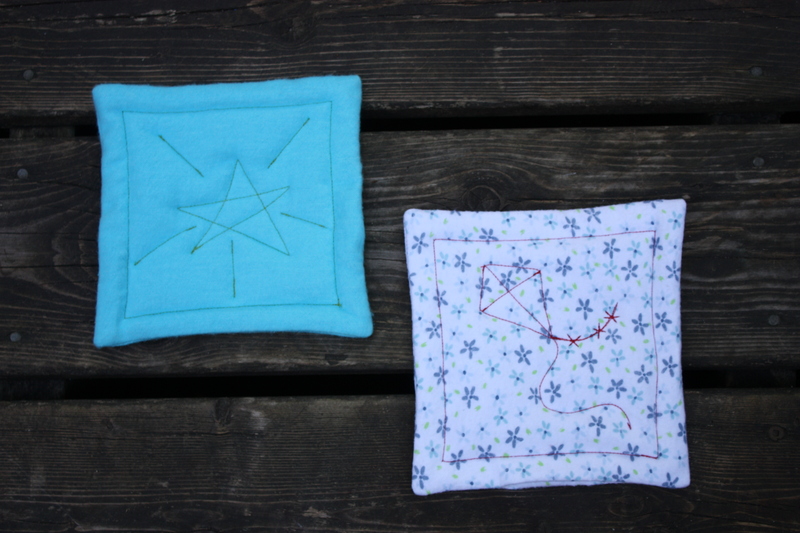 I’m excited to string them all together on the boys’ wall at the end of the as a quilty-garland! I have been thinking about home a lot lately, perhaps because I am on the cusp of a big driving trip across the country to Alberta where I grew up. 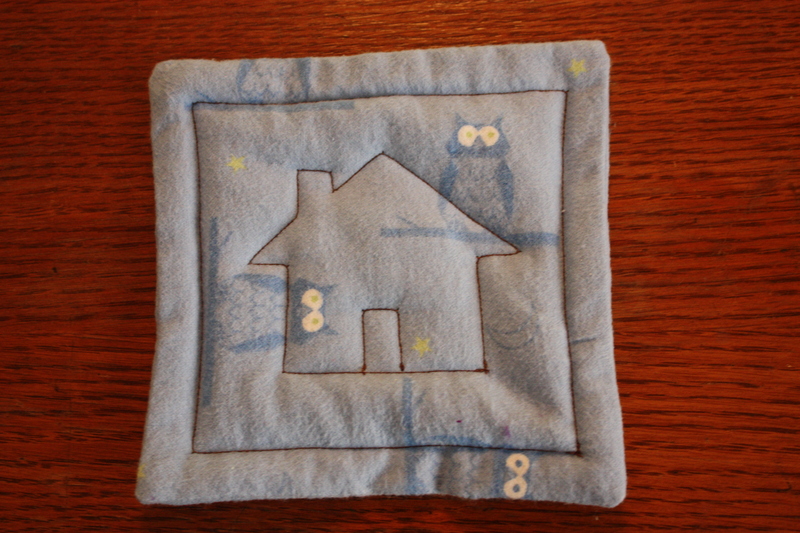 So I feel certain that June’s 2012 Quilting Challenge square should be a house! I love that Mr. Owl looks like he’s perched on the roof top. I have many places I call home. Alberta of big sky and my first 20 years is home. City: Edmonton, neighbourhood: Parkallen. Friends and family, school and lessons, choir and dancing, adventures on foot, bike, bus and car, flights of imagination in the backyard. It’s more the memories that are home because by now a lot of the people have moved and the landscape has changed a fair bit. It’s the capital “H” home of my mind and heart. Toronto is my adult home, In fact I’ve been here for 14 years as of this week — maybe that’s why home is on my mind! I came for dance school and fell in love with the city. And with a boy, who I married. I discovered how strong and able and independent and brave I am in this big city. And to my continued surprise, I rarely manage a streetcar ride without seeing someone I know. it’s become the lowercase “h” home, but no less important in my list of homes. Now Toronto’s Cabbagetown is home-home. A house-of-dreams (yes, you are correct, that’s an obscure Anne of Green Gables reference) and its century-home maintenance realities is the literal roof-over-the-head-home. Now I am maker and keeper of the first home my boys will remember, with their own set of smells and colours and sounds and favourite corners. Their own intangible roots are stretching from this very house and city into the world. And Adam, that boy I fell in love with, he and our 2 boys are HOME. All caps. Full stop. They are my chosen home, my heart and my landing place, my still point. My friend Shannon Litzenberger, a prairie girl from the prairiest of all provinces (Saskatchewan of course!) and a powerhouse artist, arts advocate and policy junkie, is currently developing a dance project called HOMEbody. It’s a multi-faceted artistic musing on what home is, literally and figuratively. Definitely worth checking out! 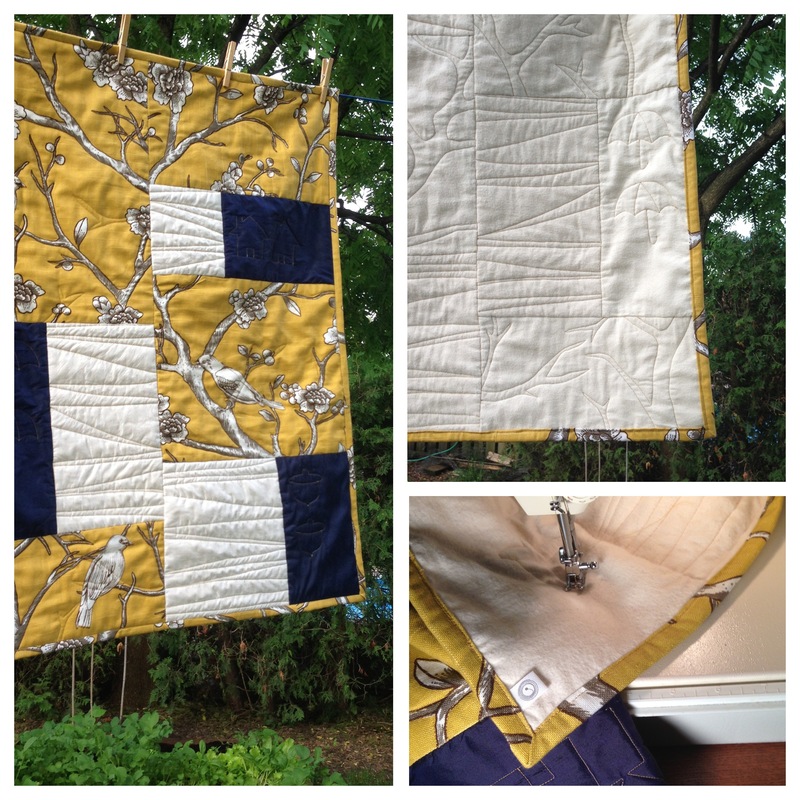 I finally finished the bird-patterned quilt I’ve been planning and working on over the past few months. This was the project that kept getting bumped aside for other more pressing matters and crafts. But its time has come! 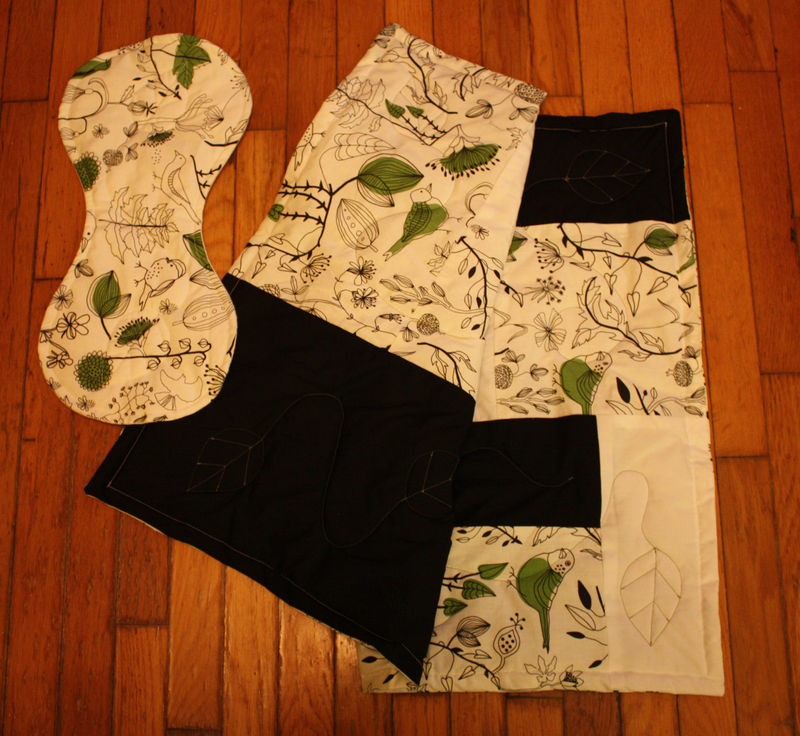 I present the Birdie Quilt and Burping Pad Combo. I plan to carry this set on my Etsy store when I’m up and running in the summer, so the next step is to make some more sets. I am so happy with how this design came out. I like the big, chunky blocks and have always been attracted to baby stuff made with strong colours and a pattern that’s not so common. 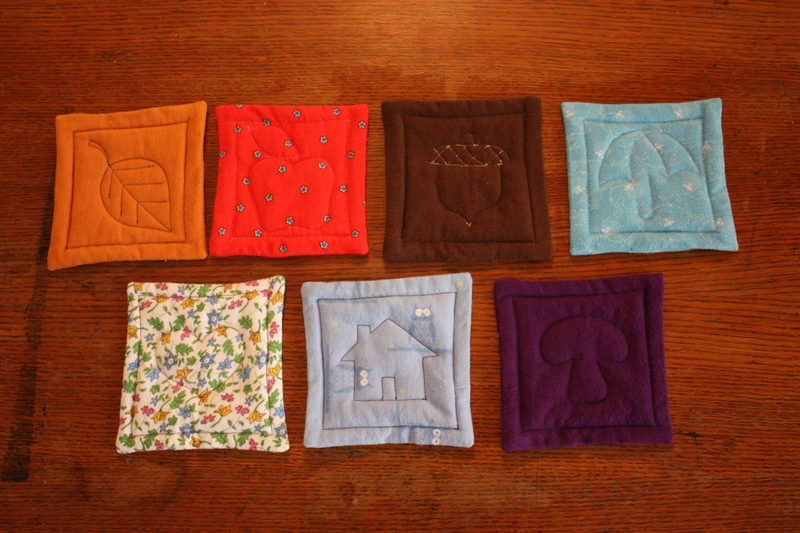 On the simple, flannel side of the burp pad and the blocked side of the quilt I used green thread so that the quilted leaf design would stand out. 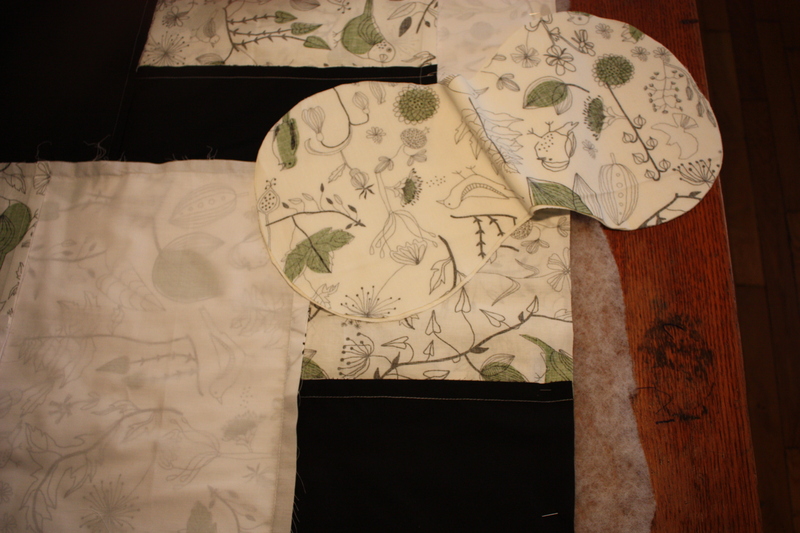 It’s fun to quilt this pattern free-hand on the machine, reminds me of painting or sculpting. Probably my favourite of the process! 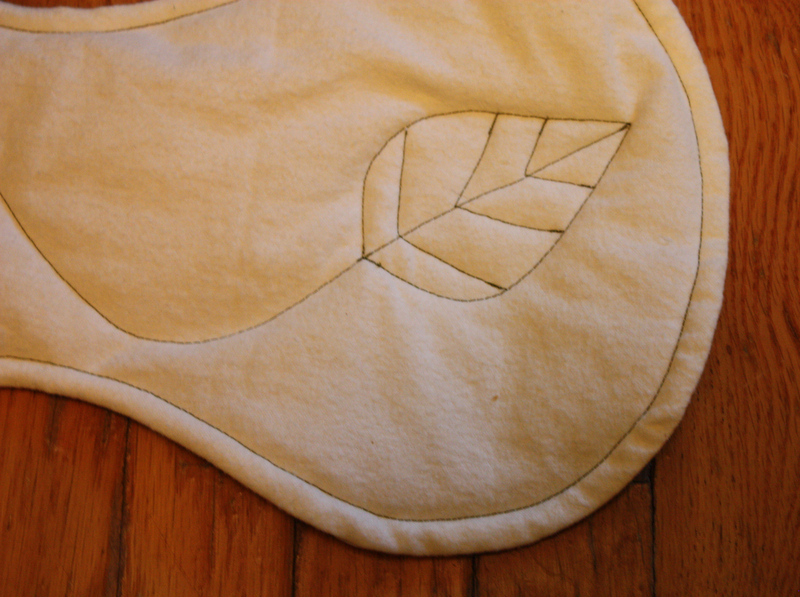 The busy side of both pieces is stitched with white thread. 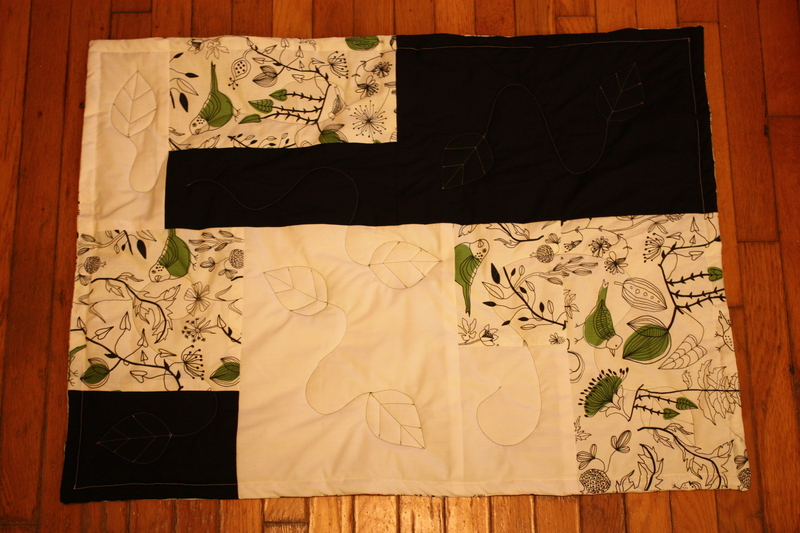 The leaf quilting almost needs to be felt to be seen amidst the birds and foliage. I hope the detailing invites fingers to touch and baby cheeks to rest peacefully. I’ve been reading and thinking about pricing and perceived value. Burping pads, my speciality, are just not that cost effective. The ones I make are relatively labour intensive but there’s a limit to what people will pay for such things and it’s not a lot more than a super fancy latte! 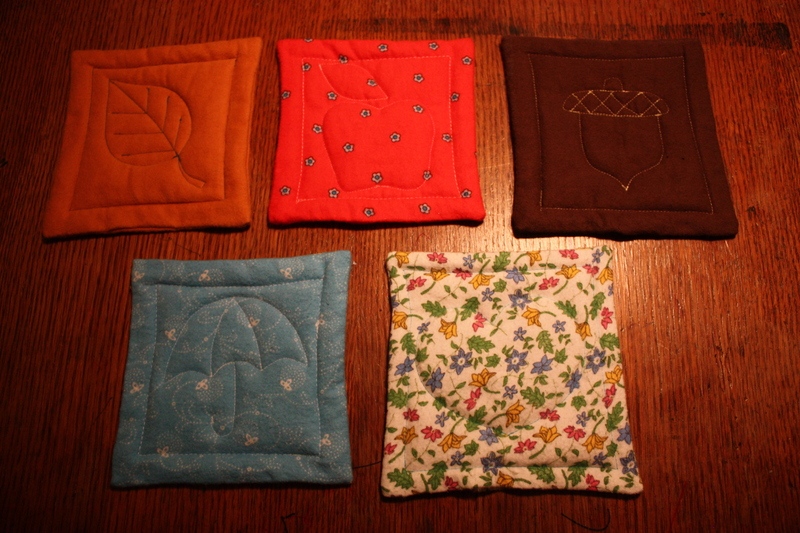 I see a lot of sewers undervaluing their work on Etsy, burping pads for as low as $2.50 with a median of about $8 per pad, which I find totally ridiculous and frustrating. I think it may be one of the great failings of such a platform, that value gets diluted with uneducated or timid artisans not really understanding how to value their work. Because mass-produced brand names versions often go for close to $20 per pad! Anyways, I’m slowly working on the math to find the sweet spots for pricing my work. PS: I wrote this entry with a sleeping 8-month-old draped across my arm and lap. My wrists have been performing acts contortion in order to type! Insane perhaps, but I find that getting my blog post ready the night before is more enjoyable and practical for the most part. It’s just too hard to get a long chunk of time at the computer amidst the littles and isn’t fair to them. And I really am enjoying blogging, it’s helping me keep on some kind of task creatively I am surprised by how much I enjoy the act of writing and sharing here. Over and out. April is flying past me, like a train with cars bearing birthday, Easter, bathroom-construction, birthday, teething-fever, bathroom-construction, sewing-gig, taxes, birthday, sewing-gig, birthday, teething-fever, bathroom-construction and so on — whip, whip, whip, blurring my vision and leaving me gasping! 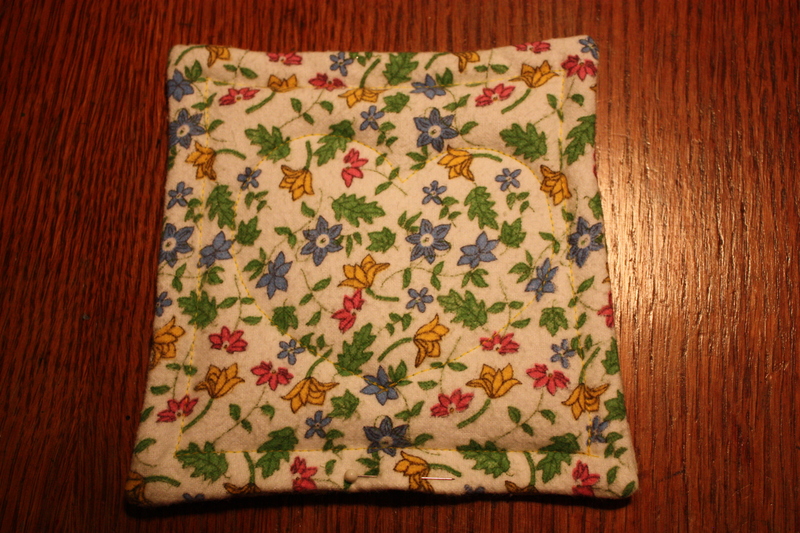 Before the month is out, I need to add April’s quilt square to my 2012 Quilting Challenge. I really had no ideas but then as I was hemming pants for a costume gig the other night, it hit me out of the blue that an umbrella would be sweet! 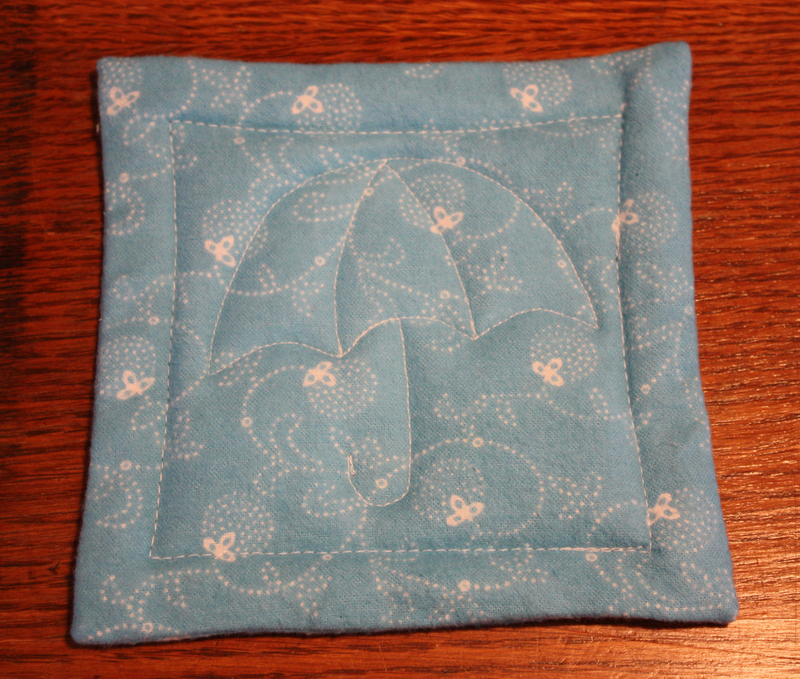 And so it is, particularly on this fabric that almost looks rainy. 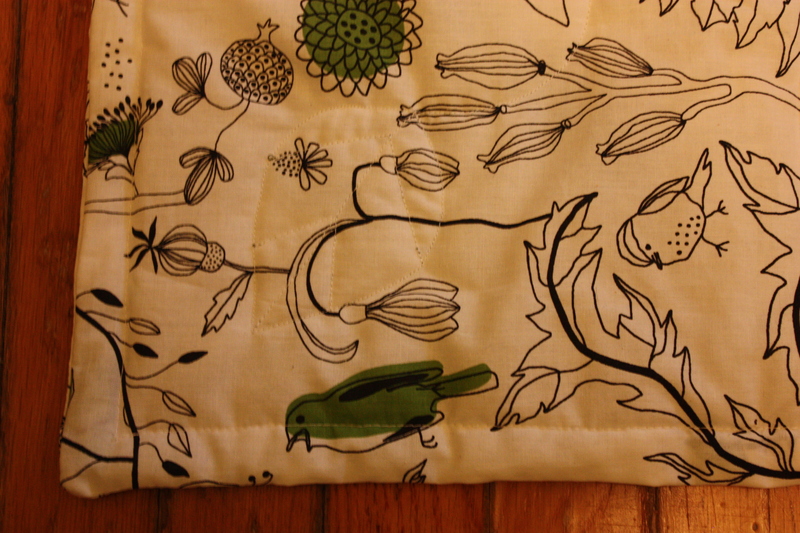 I’m so charmed with this one and excited to use it on burping pads and quilts. Anutie Maria, my lovely sis, came over today and brought Beyblades as a birthday gift for Rudi. I only know about these toys because I have a 7-year-old nephew. If you don’t know and you want to know, check ’em out. I have learned that they are insanely popular among the cool kids these days and Rudi is beside himself to now be counted among the owners of these battling tops. We decided to try a Martha Stewart craft with Auntie M and in honour of spinning tops and battling Beys, we used spiral designs of course! 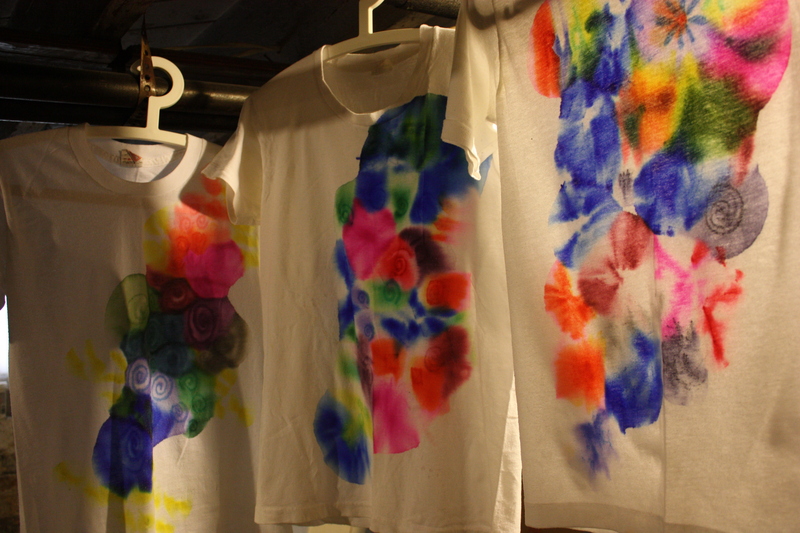 Who knew you could tie-dye with Sharpies?! And I do love Sharpies, so much so that I have a huge multi-colour set. You just draw with Sharpie and then drop Isopropyl alcohol on it and heat-set the colour. For the full instructions go check out Martha and her minions. They came out beautifully and are far more hip than I anticipated. I love the intense colours! It was a great craft to do with a 4-year-old, he was able to draw on the shirts with ease and worked the dropper like a charm. At about 15 minutes total, it was good for a shortish attention span. Then Rudi was back to lettin’ ‘er rip. That’s right, that was a Beyblade reference. Boom, dropped it in just like that. For myself, I went back to a project I’d set aside a while ago but which calls to me every day, ‘fiiiiinnish me, I’m so looooovely, you waaaaaant to” and so on. It’s a quilt I’m developing for my Etsy shop. Here it is with it’s seams showing! I’m still building up product stores and not ready for the opening part of the Etsy shop, but I’m getting closer and getting excited to wade in. 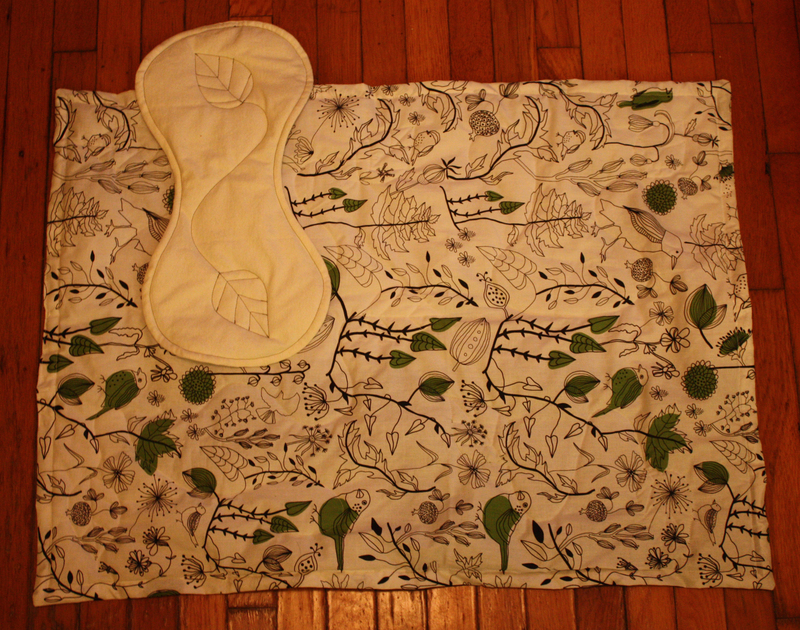 This lovely piece should be done by the end of the week, along with it’s matching burp pad. 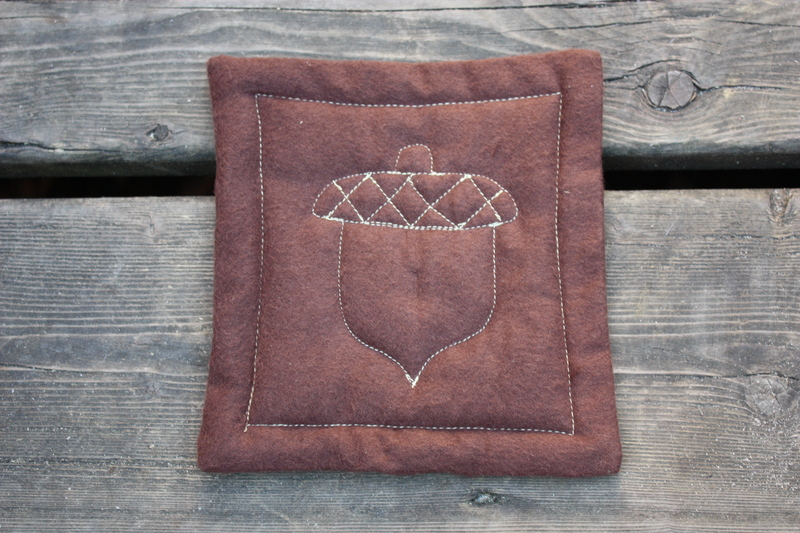 In the continuation of my 2012 Quilting Challenge to myself I present my March quilting pattern, the acorn! It’s joined here in birth order by leaf and apple, January and February’s offerings respectively. One more pattern to use on my quilts and burping pads, done. I love nuts. That sounds a bit wrong but I’ll leave it, cause it’s true! I don’t remember ever seeing a chestnut or an acorn on the ground in Alberta, but they’re everywhere here in Ontario! And while the colour and texture of a chestnut is fantastic, it’s a bit of a blob when it comes to outlining it, not so inspiring. But an acorn, what a charmer! A lovely shape, makes me think of gnomes and chipmunks and quiet, mossy spaces.